Workers’ Notes Banners bright in Tolpuddle! THOUSANDS of workers marched behind their union banners through the small Dorset village of Tolpuddle last Sunday. They marched to honour the six farm workers who were sentenced to seven years penal servitude in Australia in 1834 for forming a trade union. A massive protest swept across the country. 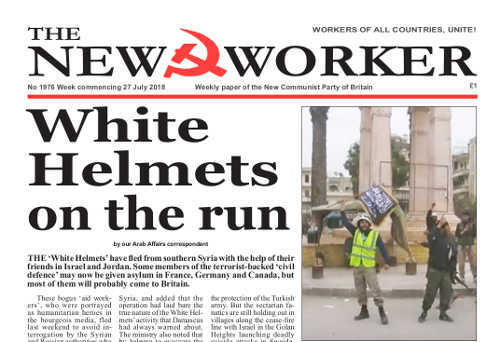 The working class rose up in support of the Martyrs. A massive demonstration marched through London and an 800,000-strong petition was delivered to Parliament to demand their freedom. After three years, during which the trade union movement sustained the Martyrs’ families by collecting voluntary donations, the government relented and the men returned home with free pardons and as heroes.. ..
Read the full story here >> Banners bright in Tolpuddle! Read the full editorial here >> Defend Jeremy Corbyn!